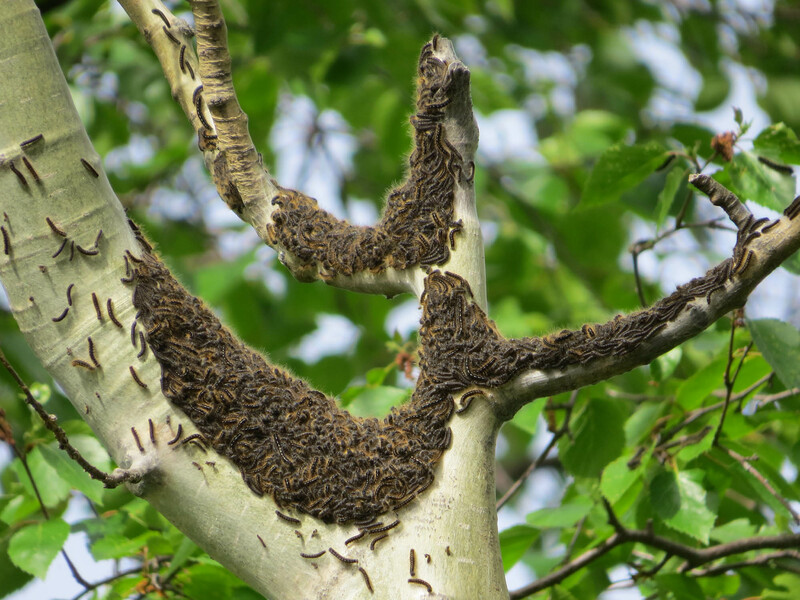 Every 8 – 10 years or so tent caterpillar populations explode on the Prairies. Outbreaks can last 2 – 3 years. It can be alarming to see the damage caused by a large outbreak of tent caterpillars, especially to trees on acreages and shelterbelts. Sometimes the caterpillars completely defoliate trees. Fortunately, most trees recover very well. Egg bands found on the lower branches of trees and shrubs hatch in spring, just after trees have leafed out. Hatched caterpillars or larvae tend to cluster in webbed “tents” in the crooks of branches. They also crawl along branches and twigs to feed on leaves. Sometimes masses of caterpillars following scent trails migrate from tree to tree, looking for new food sources. They usually feed for about 6 weeks. In early summer, caterpillars spin cocoons inside a folded leaf. Cocoons also appear on fences, decks or the eaves of buildings. The pupae inside the cocoons emerge as moths in mid-summer. In late summer after mating, female moths lay bands of eggs on the lower branches of trees and shrubs. The moth dies but the egg bands survive winter. Over 60 species of birds feed on both caterpillars and moths. 28 insect predators and 127 insect parasites attack eggs and pupae. Many other animals including bats, mice, frogs, squirrels, skunks and even bears eat caterpillars and/or moths. Remove the egg bands when trees have shed their leaves in fall, winter or early spring. Each egg band contains about 300 eggs that will hatch next spring. 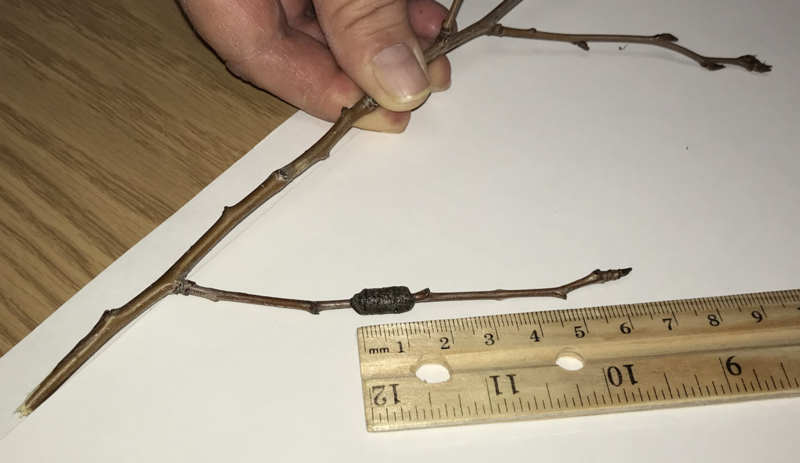 You’ll find the bands on the twiggy ends of lower branches of trees and shrubs. The band itself is small – about 1/2" or 1 cm wide. Either gently scrape them off or simply cut the twig. Dispose in the garbage. When caterpillars are active in spring, handpick and drop them in a pail filled with an inch or two of water. They drown easily. Knock caterpillars out of your trees with a blast of plain water – that will kill a lot of them. Use a broom or a shop-vac to sweep up large numbers of caterpillars. You can squish them too. Put them in your compost if they are dead, or bag them up and put them in the garbage. If caterpillars are migrating to other trees, try making a temporary barrier by wrapping duct tape or tin foil around the trunk of trees without caterpillars. Coat the barrier (not the bark) with vaseline or tanglefoot to slow down the migration. Check the barrier daily to remove and destroy any caterpillars stuck on the wrap. Remove the barrier once the caterpillars have started making cocoons in mid summer. Remove and destroy the cocoons found inside the folded leaves of trees. Scrape them off buildings, decks and fences. Bag them and put them in the garbage. Bacillus thuringiensis (BTT or Bt) is a bacterium that is sprayed on leaves. If a caterpillar eats the leaves, the bacteria will kill it. This works best on small feeding caterpillars. It is not practical for large trees or large stands of trees and will also kill all other soft bodied insects it comes into contact with. Many of our native butterflies are also active caterpillars at the same time as the tent caterpillars and our butterflies are already facing significant ecological pressures. The tent caterpillars are a nuisance pest that while annoying, don’t typically create lasting harm, and our native butterflies are important to our ecosystem. As such, we don’t recommend spraying with a pesticide, even one as low impact as Bt. Wide scale applications of other chemical insecticides is not recommended. Insecticides also kill predator insects which help to collapse large caterpillar populations. The short ridge on this branch is a tent caterpillar egg band. Your best caterpillar prevention is to remove these in the fall through spring. Simply scratch it off with your fingernail or a knife, or prune off this branch and dispose of it. Each case holds about 300 caterpillars so you can make a big difference, quickly! Keep them healthy by giving an inch of water once a week, less if there is rain. Don’t fertilize, especially when the caterpillars are feeding on leaves. Lush growth from nitrogen combined with defoliation will further stress your tree. Caterpillars do most of their feeding at night. Caterpillars eat the leaves of trees and shrubs, but aspen is a favorite. They also feed on oak, basswood, ash, poplar, cherry, plum, raspberry and many other plants. Research has found that weather patterns are a factor in large outbreaks. Populations tend to increase in years with cooler winters and warmer springs, and tend to collapse in years with a cool spring followed by a warm winter. Tent caterpillars are quite fatty as they age and are food sources for multiple bird, bug and amphibian species. Black bears in particular feast on caterpillars and may eat up up to 25,000 a day, with the caterpillars often becoming the bear's main food source in late spring. Though they are voracious caterpillar eaters, we cannot recommend bears for pest control unfortunately. We do recommend making your yard as bird and beneficial insect friendly as possible by providing habitat and reducing your pesticide use so that other animals may assist you in controlling unwanted outbreaks. Why is my evergreen turning brown and losing needles?